Coming off New York’s record setting winter storms of 2015-2016, New Yorkers are growing accustom to regular appearances of “monster snowstorms” and heavy snowfall. One such storm, the blizzard of January 22-23, 2016, produced over 27 inches of snow alone. Needless to say, city residents and building owners worked overtime to keep their driveways and sidewalks clear of snow and ice. 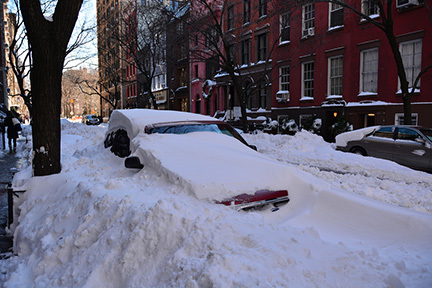 And with New York City receiving over 50 inches of snow in each of the last three years, residents have learned to stock up on supplies and prepare for the rigors of snow removal. But snow removal doesn’t have to be an endless cycle of grueling physical workouts with the snow shovel. Many home and business owners in New York City are turning to radiant heat. In addition to eliminating the need for manual snow removal, automated snow melting systems enhance safety for pedestrians entering and exiting businesses in New York City. 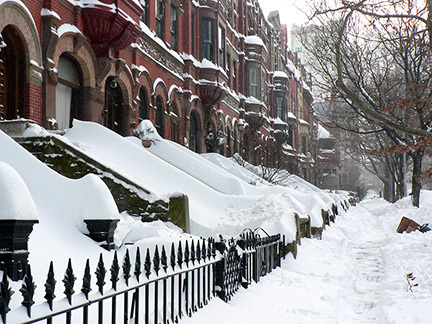 Brownstone apartment buildings in New York City after a significant snowstorm. Warmzone snow melting systems are fully automated, so they operate only when needed. The system includes an advanced snow sensor that detects temperature and precipitation. When temperatures are below a set point – typically 39 degrees Fahrenheit – it signals the controller which sends power to the heat cable. New York City wakes up to a heavy blanket of snow and colossal snow drifts the morning of January 24, 2016. Contact Warmzone today and learn more about the radiant heating options that are available. In addition to offering heated driveways and snow melting systems. Warmzone also offers premier roof deicing and floor heating systems. Call 888.488.9276 to learn more.